If you are still finalizing your spring 2015 schedule, don’t miss this extraordinary opportunity and register for International Law this coming spring! We are proud and honored to welcome Mr. Arnold Pronto, Senior Counsel with the United Nations, to be the guest lecturer in International Law at Pace Law School this semester. He will be co-teaching approximately one-third of the classes with our own Professor Thomas M. McDonnell in his International Law course. Professor Pronto is a Senior Legal Officer in the Codification Division of the Office of Legal Affairs of the United Nations, working primarily in the field of the codification and progressive development of public international law. As a member of the Secretariat of the Sixth Committee, his activities have included working on the negotiation of several international anti-terrorism treaties, as well as the establishment of the International Criminal Court. 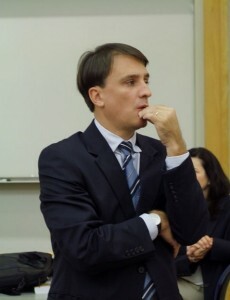 He has also been in the Secretariat of the International Law Commission since 1999, and has worked on the topics of state responsibility, the responsibility of international organizations, diplomatic protection, the effects of armed conflicts on treaties, and the protection of persons in the event of disasters and provisional application of treaties. He has published, given presentations and lectures, and taught, in the area of public international law and international human rights law. Professor Pronto has a Master’s degree from the Fletcher School of Law and Diplomacy and an LL.B. degree from University of the Witwatersrand, Johannesburg, South Africa. He has taught as adjunct professor at the Whitehead School of Diplomacy and International Relations, Seton Hall University and, in addition to his duties with the UN, he currently serves as an Extraordinary Lecturer at the University of Pretoria Faculty of Law, South Africa. Just to remind you all, International Law is a four-credit required course for all those intending to graduate with International Law Certificate. If you have any questions, do not hesitate to contact Prof. Thomas M. McDonnell, at (914) 422-4381 or via email, or Lucie Olejnikova, Reference Librarian & Adj. Prof. via email.